In addition to significant government funding to private clinics when healthcare is already consuming 39% of the provincial budget,[iv] there is also a problem with disclosure in other jurisdictions. For example, clinic reporting of both the numbers of abortions and the cost in British Columbia is voluntary. There is no legislative requirement to report, despite the clinics being funded by the Government of British Columbia. The lack of disclosure from clinics means that the extent to which the government is publicly funding these clinics remains unknown to taxpayers. Clinics that are independent, have no obligation to report their data, and that operate for-profit should not be funded with the limited provincial healthcare dollars. If private clinics continue to be funded with public dollars, then they should be held to the same reporting and disclosure standards as hospitals. But I ask: How would you reallocate the 16.5 million dollars annually being spent by the Alberta government on abortions? [ii] Canadian Institute for Health Information. “Induced Abortions Performed in Canada in 2009.” Accessed November 1, 2011. http://www.cihi.ca/CIHI-ext-portal/pdf/internet/TA_09_ALLDATATABLES20111028_EN. [iv] Government of Alberta. “Budget summary by ministry.” Accessed November 1, 2011. http://alberta.ca/acn/201102/2995902%20BudgetSummarybyMinistry_Budget2011%20-%20Final.pdf. [v] Canadian Institute for Health Information. 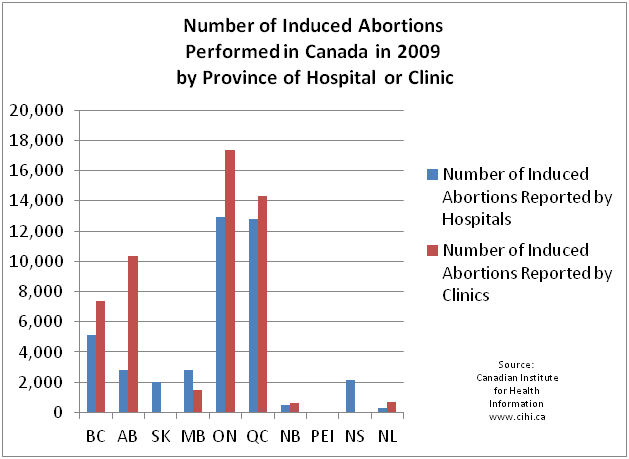 “Induced Abortions Performed in Canada in 2009.” Accessed November 1, 2011. http://www.cihi.ca/CIHI-ext-portal/pdf/internet/TA_09_ALLDATATABLES20111028_EN.